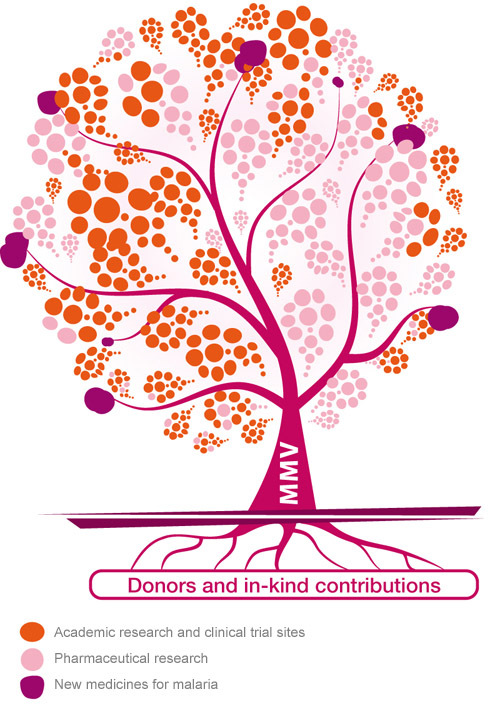 With financial support from donors, MMV brings together academic brain and pharmaceutical muscle – adding its own scientific expertise – all to make antimalarial research blossom and bear fruit. In the late 1990s an innovative collaboration model for R&D for neglected diseases emerged in the form of public-private partnerships (PPPs) that came to be known as product development partnerships (PDPs). PDPs were created from a desire to generate innovative approaches to alleviate the global burden of neglected diseases by taking the expertise and knowledge of both the private and public sectors, and exploiting each of their strengths to find the most efficient and effective solutions. PDPs address the lack of commercial incentive to undertake R&D for vaccines, diagnostics, and drugs for neglected diseases of the developing world. They use public and philanthropic funds to engage the pharmaceutical industry and academic research institutions in undertaking R&D for diseases of the developing world that they would normally be unable or unwilling to pursue independently, without additional incentives. The PDP itself does not often have the capacity or infrastructure to undertake early stage development projects in-house; instead, it relies on its partners for financing and other in-kind contributions (i.e. laboratories and expertise) and it itself allocates resources to the most promising projects, coordinates partner activities for various stages of the R&D process, and manages the project portfolio. The PDP acts as a facilitator, bringing dedicated sources of funding and know-how to committed researchers so they can collaborate on the right projects to fulfil the objectives of the PDP’s mission. The specific objectives of individual PDPs vary, but the basic mission is the same: to develop pharmaceutical products for use as a public good to address the health needs of vulnerable populations in the developing world.